Tori James » Wimbledon has begun – fancy a strawberry tea? Wimbledon has begun – fancy a strawberry tea? Some things are meant to go together and I’m sure you’ll agree that tennis and strawberry teas are one of them. 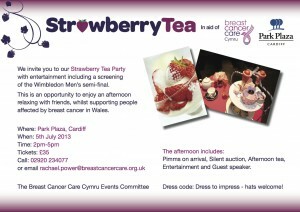 If you’d like to watch the Wimbledon Men’s semi-final, enjoy an afternoon tea and raise money for a good cause then come along to a Strawberry Tea at the Park Plaza Cardiff on Friday 5 July, 2-5pm. I’m proud to support this event and I’m honoured to be attending as the guest speaker. In 2005, I was part of a team of 3 ladies who were hoping to become the first all-female team to complete a 360-mile race to the Magnetic North Pole. In the process we chose to support a Breast Cancer charity. I’ll be speaking about this expedition and a few others too.